Hooray for Jane and Rhea, my first two sewing students! Yesterday we finished our class, and we've had lots of fun together over the past three sessions. I really appreciated their enthusiasm and graciousness, plus I was grateful to dip into the teaching pool with just two students rather than jumping off the diving board with a full class. The December class is fully booked, and now I feel ready to make the leap (to the deep end of the pool, if we're going to keep that metaphor going). 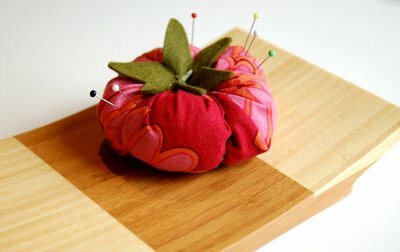 This sweet little tomato pincushion was a gift from Rhea. I just love it! She used the instructions from Martha Stewart, and I think the floral print is so perfect. See that gorgeous wool felt on the top? New source I hadn't heard of before: Brooklyn General Store. The Kiddo and I will be making a field trip soon. It looks like a fun shop. And the best part about Rhea's pincushion? I had just decided it was time to treat myself to some nice pins: the really fine ones with the glass heads. I've been using industrial dressmaking pins since school, which are really thick and strong so that you can push them into a dressform. I'm eager to find some time with the sewing machine so I can try out these fancy, extra-fine lovelies. 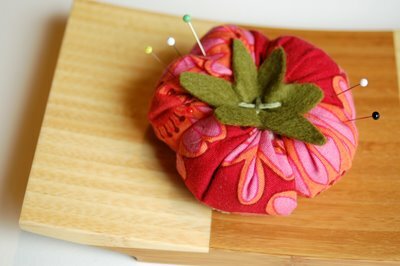 And the new pincushion is a perfect place to keep them so I can admire them all together. Congrats on getting started with your teaching, and I'm glad it's going well so far! That pincushion is adorable too. congratulations! brooklyn general is one of my favourites. the owner, catherine, is great, and their stock is just fantastic. another shop in the area for truly odd odds and ends is baltic bazaar on atlantic avenue, a thrift shop that has vintage fabric remnants, buttons ($1 a cup), and notions in the back section of the store. 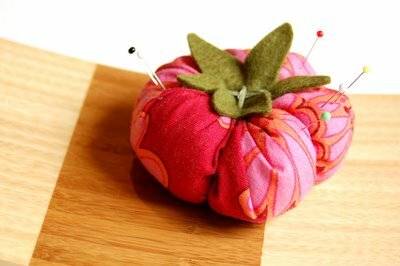 Where do you teach sewing? I am looking for a teacher!